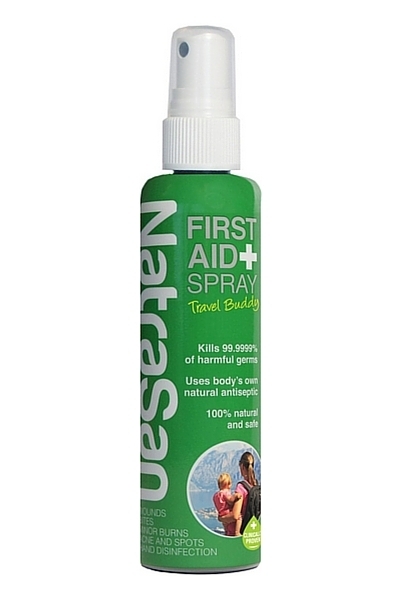 If you saw my camping essentials post from earlier in the week you will see that I mentioned Natrasan First Aid Spray. Well today I’m giving you the chance to win not one, but TWO bottles of Natrasan Travel Buddy. Natrasan Travel Buddy, is the same effective first aid spray, but in a smaller 100ml bottle, which makes it perfect to pop in your backpack, handbag, changing bag and even your hand luggage if your flying. As you can see, it is a very handy bottle to keep around, especially when you have children who are prone to bumps and bruises like I do! I can also vouch for it’s effectiveness when soothing midgey/gnat bites after spending an evening on the allotment and came home itching like fury, a couple of squirts of Natrasan and the itching was almost gone instantly and had disappeared after a few minutes. It smelled faintly like the chlorine in a swimming pool when I first applied it, but this went as soon as it was dry. If you would like to in two bottles of Natrasan First Aid Spray please enter below. Sounds good as it has a lot of uses. This would be great with my 2 accident prone sons! Such a great product, fab idea! I’ve heard great things about this brand. Would love to try! Thanks for the giveaway! Great giveaway, good luck everyone! Great prize. Versatile and practical. Much needed when you have kids! With 3 kids this would be so handy, they are always falling over and scrapping their knees and elbows! Very handy prize. Thank u for this chance! Really could have done with this today when my little girl was stung by a nettle! It’s great that it has so many uses. Great looking products & fantastic that this bottle can be taken in your hand luggage on flights. My daughter-in-law has five children so this would be invaluable.